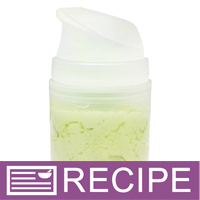 Emulsify green tea butter and grapeseed oil to water to create this moisturizing handmade lotion. Pack the beneficial properties of green tea into this handmade lotion. This lotion making project guides you to create lotion from scratch using green tea butter, grape seed oil, water, and emulsifying wax. 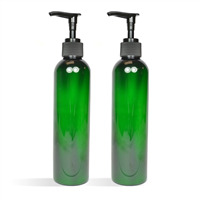 Additives are also incorporated including a fragrance oil that threads the aromas of fresh cucumber and green tea into the lotion. 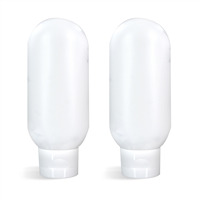 The therapeutic scent coupled with the airless pump packaging will entice customers to purchase this moisturizing lotion. You Save $10.16 by purchasing this kit rather than buying the items separately. "It smells great and it soaks in quickly"
COMMENTS: This lotion is on the thicker side, but it goes on easily and leaves no greasy feel for me. It moisturizes my skin and leaves my skin feeling smooth. I love the scent, too. COMMENTS: Recipe was easy to follow and the finished product is excellent. I will buy again! COMMENTS: I'm recommending my customers to use it as a "night cream" or for those with very dry skin as it's such a heavy lotion. The directions could use to be written more clearly as well. Making the lotion went well but I had to put a lesser amount in each container than recommended. "Very Impressed with finished product!" COMMENTS: I have made A LOT of WSP kits, & I really love this one. I do think some of the ingredients were on the "skimpy' side, but all in all, once I had my labels on this product, I am very impressed with the finished result & think this will go nicely with my "Green Tea" line of products. Loved the Green Tea Butter, its great & the scent is spot on for this recipe. Would buy more, once its back in stock!! Very happy, highly recommend. PS: Brought home what was supposed to be my shop sampler to use myself & I love it. COMMENTS: I love the way these turned out! The containers are perfect! I will definitely make them again! "Amazingly simple and very well received"